This effect simulates sketching a path. 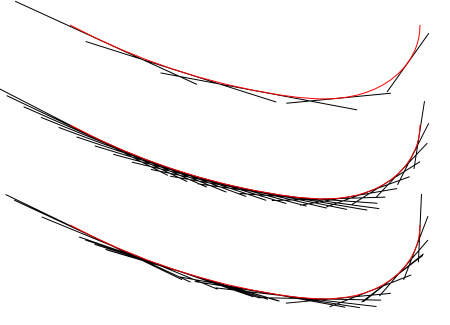 There are two different kinds of lines drawn: The first are Strokes that follow the curvature of the path. The second are Construction lines that are straight and tangent to the path. Top to bottom: The skeleton path. The resulting path when the Sketch effect is applied with default values. After setting Strokes to 1 and Construction lines to 0. After setting Strokes to 0 and Construction lines to 5. Strokes: the average number of strokes along any point on the line (not counting overlaps). Max stroke length: maximum stroke length in pixels. Stroke length variation: random variation in stroke length in units of Max stroke length. Max. overlap: maximum amount strokes overlap in units of Max stroke length. Overlap variation: random variation in stroke overlap relative to Max. overlap. Max. end tolerance: random variation in position of outermost stroke ends relative to Max stroke length. A non-zero value effectively shortens the length of the sketched path relative to the original path. Average offset: average displacement of strokes from skeleton path in pixels. Strokes follow a uniform distribution between twice this distance on either side of the skeleton path. Max. tremble: maximum fluctuation of a stroke from its nominal position. Tremble frequency: roughly the number of intermediate nodes in a stroke used to create the tremble. Stroke parameters. All figures with Strokes set to 1, Max stroke length set to 100.00, and Average offset set to 5. All other parameters are set to zero unless otherwise noted. The dashed box shows the length of the skeleton path and the maximum offsets (twice Average offset). From top to bottom: All parameters as above. Max stroke length set to 20. 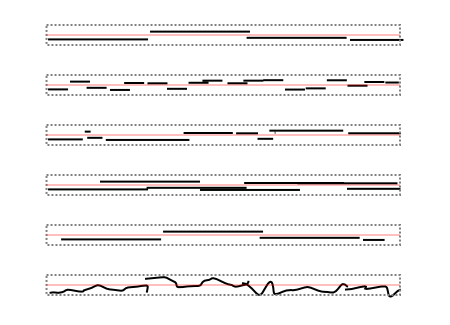 Stroke length variation set to 1.00. Max. overlap set to 0.50. Max. end tolerance set to 0.20; note that the ends are only shortened and never lengthened. Max. tremble set to 10.00 and Tremble frequency set to 10.00. Construction lines: number of lines to draw. Placement randomness: How lines should be distributed: 0.0 for even spacing, 1.0 for maximum randomness. Scale: factor correlating curvature to length of lines. 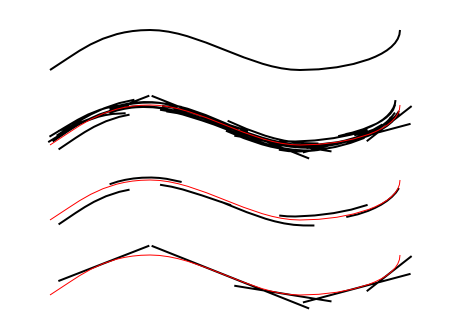 The effect attempts to keep the distance at the end of the lines equal distance from the path (given smooth curvature). Max. length: maximum length of construction lines. Lines will be shorter if the Scale factor requires them to be so that their ends are not too far from curve. Length variation: random variation on line lengths. Always smaller. Construction line parameters. From top to bottom: Construction lines set to 5, Placement randomness and Variation length set to 0.00, Scale set to 10.00, and Maximum length set to 100.00. The same as above but Construction lines set to 20. The same as above but Placement randomness set to 1.00 and Length variation set to 0.30.